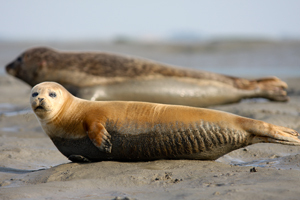 A number of Common Seals (Phoca vitulina), also known as Harbour seals, live in the Solent and often visit Chichester Harbour. This is the only known rookery in the Eastern English Channel and so they are considered regionally unique and are, therefore, very important. Atlantic Grey seals have also been spotted on occasions. Chichester Harbour provides an ideal habitat for them as they are relatively undisturbed and food is plentiful as they like to feed on fish and crustaceans. There is also plenty of mud and sand for them to rest on. Each seal has unique markings and their colourings can vary - from tan to grey, black and brown. Females are generally smaller than males and have a longer lifespan. They can be seen anywhere in the Harbour and have been known to swim into marinas and take a nap on the swimming platforms of moored boats! We know that visitors like to see the seals but, if they are continually disturbed, they may choose to leave the Harbour altogether and that would be a great shame. If you are lucky enough to see them, please view them from a distance of at least 100m and please follow the Solent Seal Code of Conduct or and review our Enjoying Paddlesports and protecting the environment leaflet. If we all respect that they need their space, hopefully, they will stay in the Harbour for years to come. 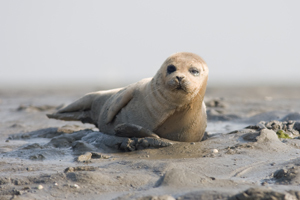 The Solent Seal project was a partnership project, led by the Wildlife Trusts South East Marine Programme in partnership with Chichester Harbour Conservancy, Sea Mammal Research Unit, and Natural England. The aim was to learn more about the Solent seal population with a view to improving its conservation. The project utilised various techniques to survey and monitor the seal populations, including visual counts at haul-outs, a public sightings scheme, photo-identification and telemetry. • Number of Harbour seals currently estimated at 23-25, with 18 being the most recorded at any one time. Being a small population makes them more vulnerable to impacts. • Only two significant haul-out sites exist, one in Langstone Harbour and one in Chichester Harbour. 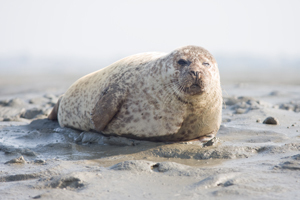 • Both haul-out sites are used on a more or less daily basis but Chichester Harbour is used by more seals. • The seals display often individual foraging behaviour and are faithful to their preferred foraging sites. • The seals predominately forage in the Eastern Solent, between Southampton and Selsey Bill, often in the harbours, and regularly cross to the Isle of Wight. • Seal foraging activity can change between seasons. • Seal foraging takes place in a variety of habitat types and can focus on discrete seabed features such as rocky reefs and underwater structures.